Dentures are replacements for missing teeth as well as surrounding tissue. If you have been in a serious accident that not only caused you to lose your teeth but also part of the gum and jaw tissue, dentures are the ideal dental treatment solution. The same problem may occur from suffering periodontal diseases and some congenital disorders. We can create complete or partial dentures to replace the missing teeth and gum tissue to ensure proper oral structure and replace the missing teeth. 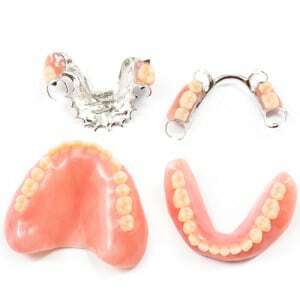 We have two main types of dentures that we use: removable and permanent dentures. All dentures consist of the gum colored base that is made of plastic resin to fit over the bone ridge where the teeth used to be. The prosthetic teeth are attached to the plastic base; they look and function similar to natural teeth. We design removable dentures to fit in place using the suctioning effect resulting from the close fit on the alveolar ridges (tooth ridges). Getting the right fit is extremely important if we expect the removable dentures to stay in place. When the you settle on getting dentures based on the advice from the dentist, we will first create immediate dentures that will help you transition to wearing dentures successfully. Gums naturally shrink when some or all the teeth are missing; there will be a lot of muscular adjustment necessary before you get used to wearing the dentures. Installing the permanent dentures immediately after the tooth extraction is not a good idea because they will not fit as well after the gum heals. Once your gums have healed fully, we can start fitting your permanent full dentures or partial dentures. You can remove these removable dentures for cleaning, when sleeping or when you simply feel like you need a rest without them. Unlike removable dentures, the dentist will secure the fixed denture in the office and it’ll stay in place unless removed. We use dental implants to retain the fixed dentures in the mouth. The dental implant made of titanium screws is surgically placed into the jaw by the dentist. Once the dental implants recover, the dentures are attached to the implants and secured in place. Partial dentures fixed in place using dental implants ae quite similar to dental bridges or crowns. We can choose to install multiple implants along the gum ridge to hold the new teeth as dental bridges. In case the gum ridge is badly damaged or deformed, we can use fewer implants to attach a gum plate with prosthetic teeth to the gum ridge. Fixed dentures are suitable if you have problems with conventional dentures moving around or making it difficult for you to talk. You can still remove the fixed dentures for cleaning or when going to bed at night but they hold much better in place during the day compared to the traditional dentures.